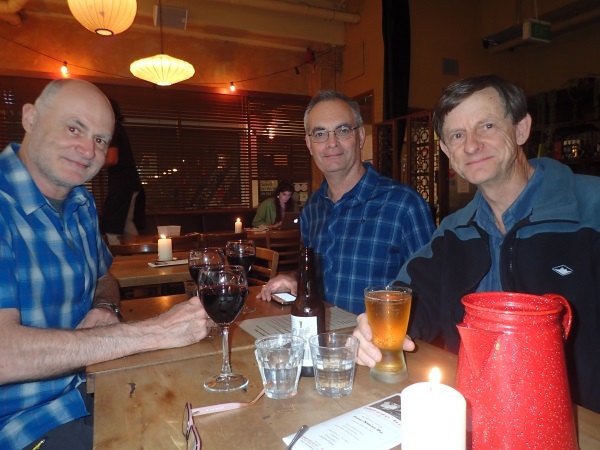 The plans for this trip started almost 12 months ago, was postponed by a few months (due to the lambing season) and then had a few days added to it so that some of us could spend time in Auckland. It’s been 48 years since I visited Auckland (and NZ) … a lot has changed! Johan V picked David and me up from Thornleigh at the ungodly hour of 4.30am and drove us to the airport … I guess when you consider that JV left his house in the Blue Mountains at 3.30am, 4.30 wasn’t that bad. Everything went according to plan and we were at Auckland Airport to meet Jox at 1pm. Hire car sorted and checked into our hotel by mid afternoon, ready to check out the sights. The first day was rainy and overcast so we decided to do a road trip around the northern part of Auckland, visiting some of the beaches. On the way home, the guys dropped me off at The Domain where I walked through some of the gardens. This short track had a lovely old bridge across a creek. 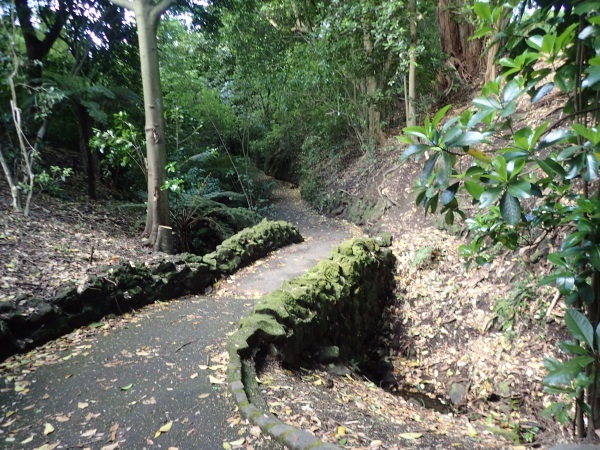 The gardens in the Domain are remnants of the 1860s. 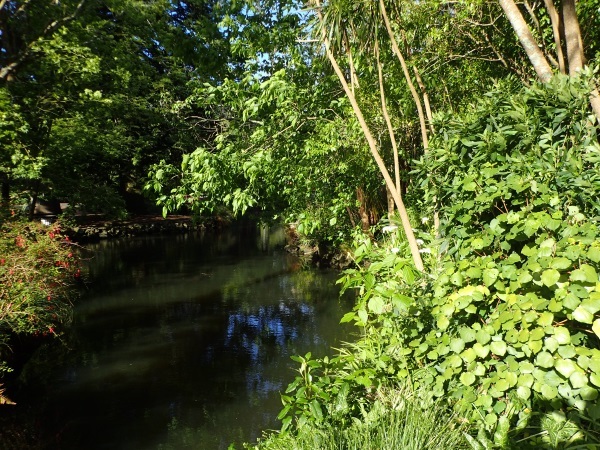 In 1867 the Auckland Acclimatization Society was granted four acres of land which was cleared, then gardens, aviaries and a house (for the curator) were erected. The gardens were used to propagate imported grains, grasses, shrubs, flowers and fruit trees. 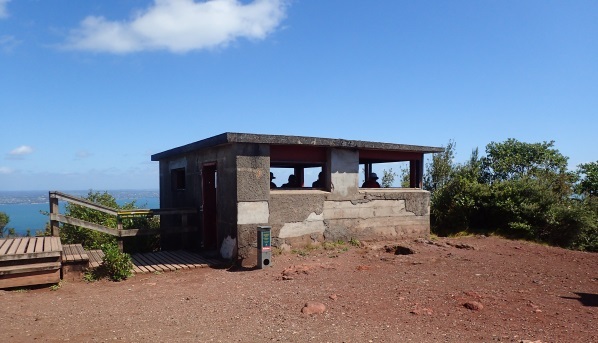 The aviaries were used to acclimatise song and other birds which were imported. Lovely duck pond in the gardens. We had dinner that night at a French restaurant (which specialised in crepes) just up the road from our hotel, the food was so good, we made a reservation for the following evening! 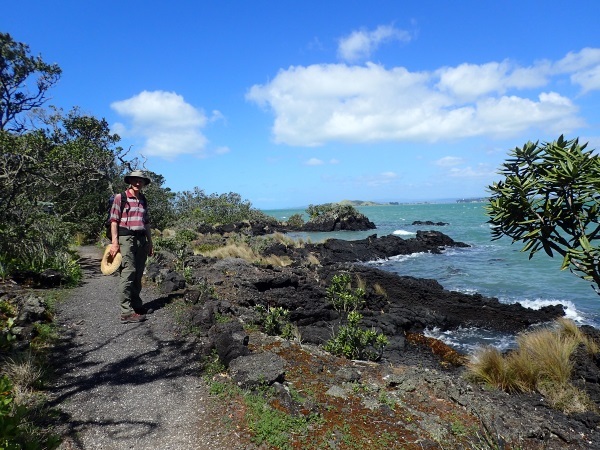 The following day we caught the ferry to Rangitoto Island. 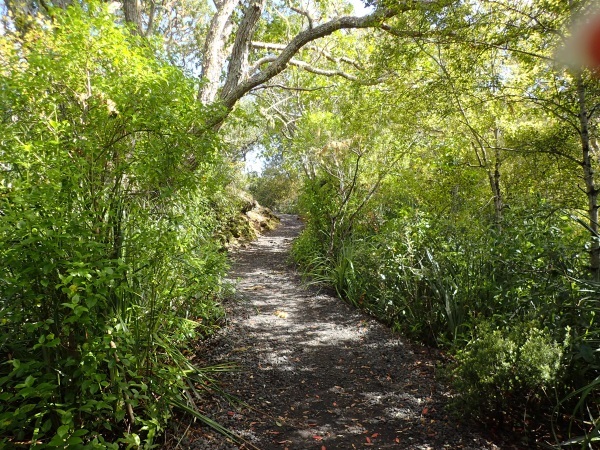 Situated 8k northeast of Auckland, Rangitoto was formed by a volcanic eruption in the sea between 550 and 600 years ago. 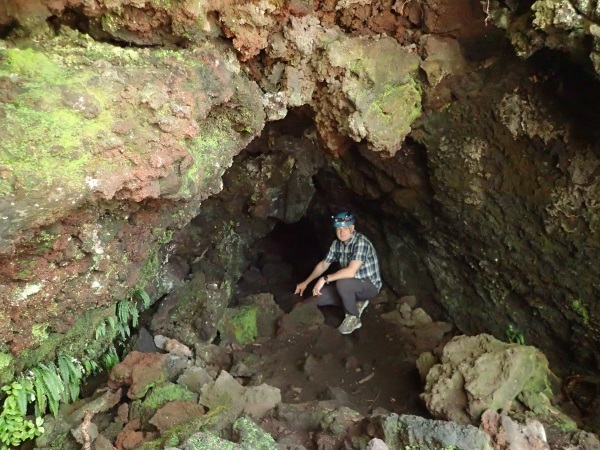 We were there to see the Lava Tubes. 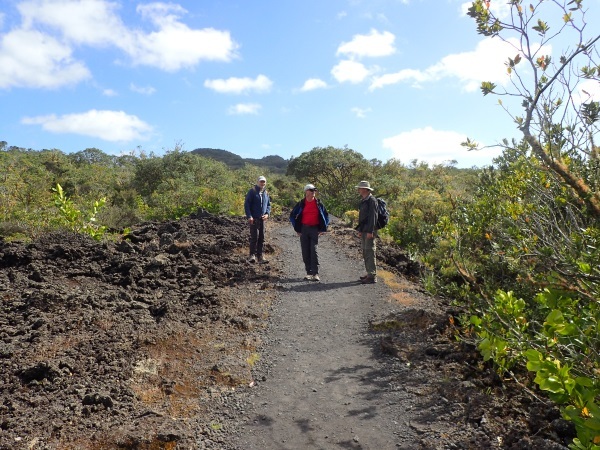 Walking up to the volcanic peak through the lava fields. 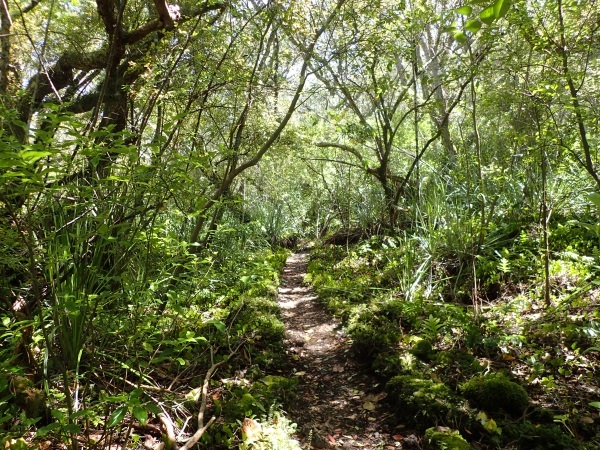 From time to time the rainforest vegetation closed in on the track. Only to open out again. The peak is in the distance, only 260m above sea level. The crater at the summit, it took us about 1.5 hours to walk there (lots of stops). 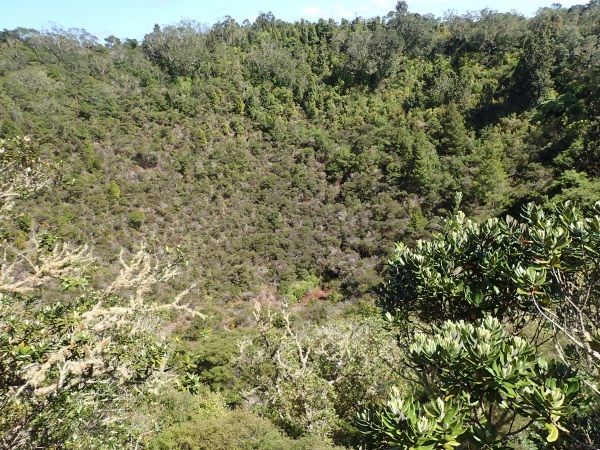 Just beyond the crater is an old WW2 bunker overlooking Auckland. View of Auckland from the Bunker. 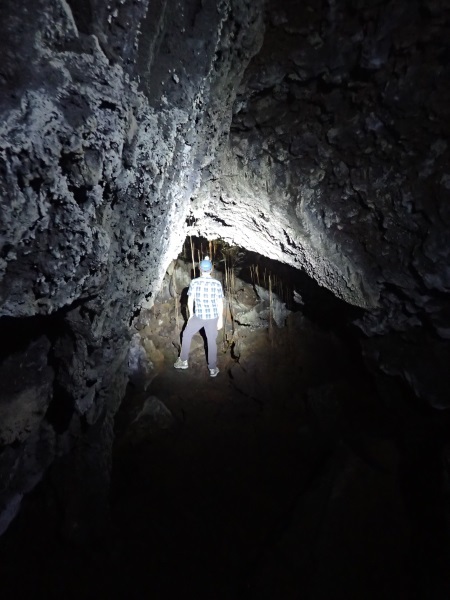 We then wandered down to some of the lava tubes set aside for tourists. This one wasn’t very big, you could walk in a short way. Where you drop down to the tube is where the roof has fallen in, allowing access. 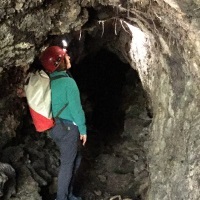 Inside the tube – imagine molten lava flowing down to the ocean. Another one of the tourist tubes, this one quite a bit longer with a daylight hole half way through it. JV in the other end of the tourist tube. After checking out the tourist tubes, Jox and I set off to find some gps locations where Jox had been assured were tubes that the tourists didn’t get to see. JV and David (wisely) stayed up on the track as Jox and I beat our way through impenetrable scrub. It was like trying to find a needle in a haystack. Just when we’d given up, we walked past a “hole” that we’d discounted before and decided to take a closer look! And there it was, the entry. Jox went down he’s 6’+ tall so wouldn’t have any difficult (he though) getting out, I on the other had wouldn’t have a chance of getting out of this slot. 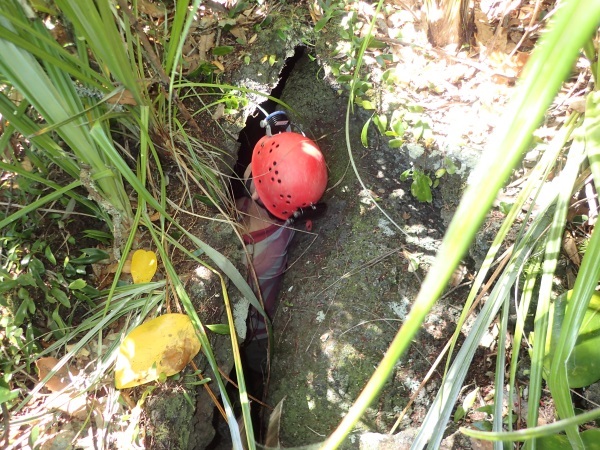 Apparently it was quite a deep tube, with 2 levels, one of which was reached via tree roots and proved to be difficult getting back up. Jox exited with lots of scratches and scrapes on his arms/legs. 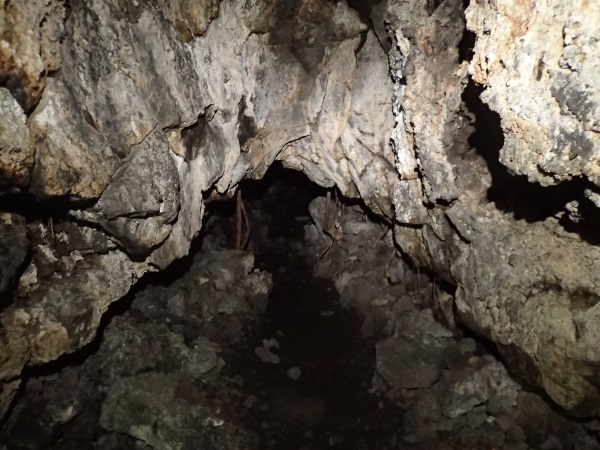 We were about 30m from the tourist track where the guys were waiting and as we made our way up to them via a faint food pad, we happened across another big hole in the ground and upon closer inspection, this was another tube, within 10m of the track. 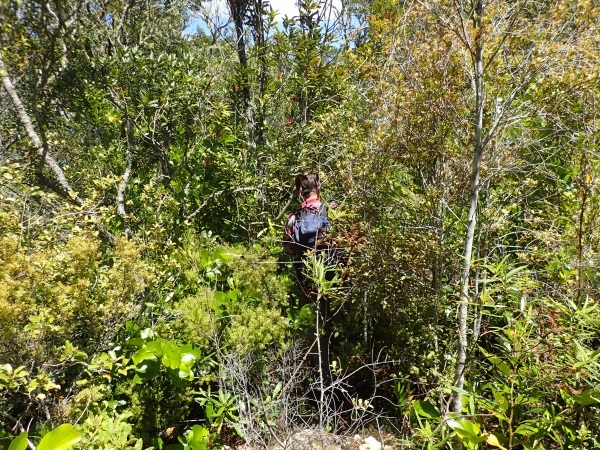 I called JV and David down to check it out – they reluctantly made their way through the scrub but were happy once they got there! 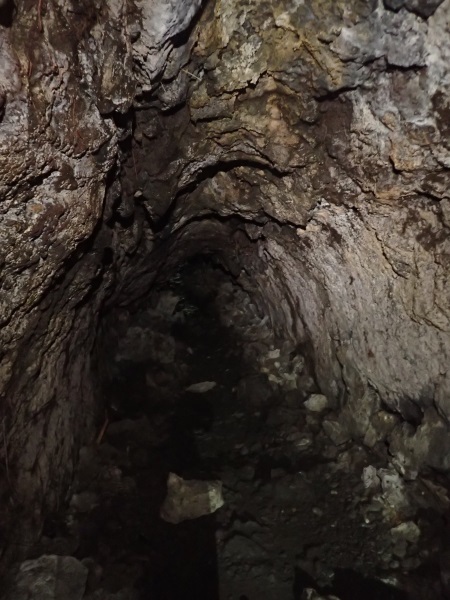 Tree roots coming through the roof of the cave. 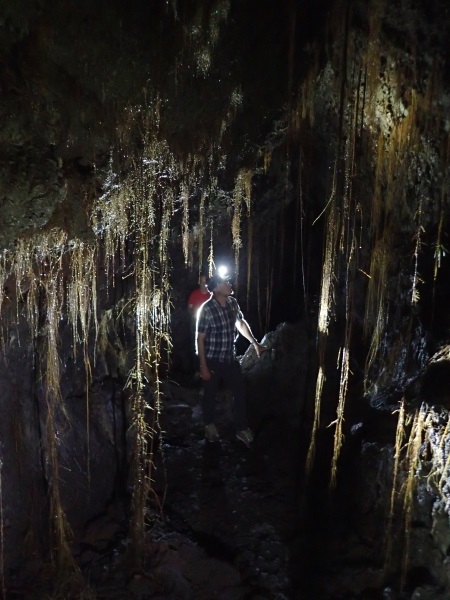 JV surrounded by masses of roots and “back-lit” by David and his high powered caving torch. More of the tube. The access hole had tubes to the left and right, the right hand one had an upper level that had a steel cable in place for hauling yourself up, we decided that our clothes would be trashed if we went exploring so headed back to the track. JV and David had had enough for the day so made a bee-line for the 2.30pm ferry, Jox and I decided to do a bit more exploring. 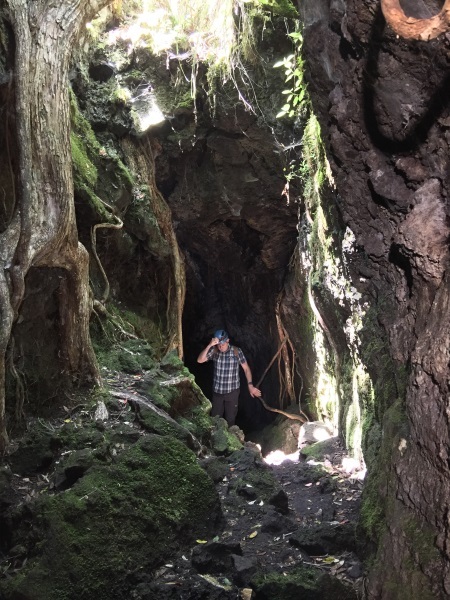 We followed the Kidney Fern Walk, like walking through Lord of the Rings country, along a small moss and stone edged track. 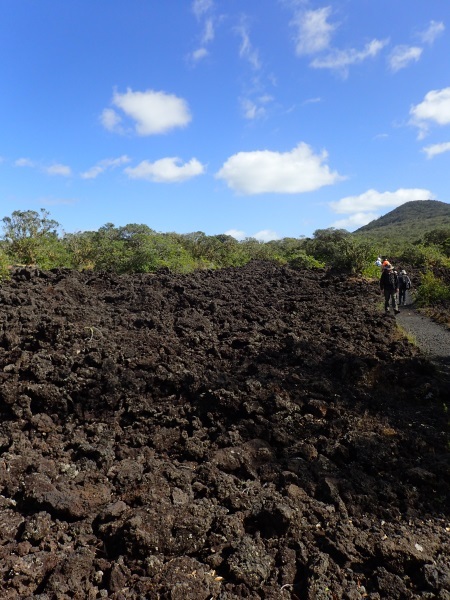 We then took the ocean track where you could see lava which had flowed down the hill-side to the ocean. 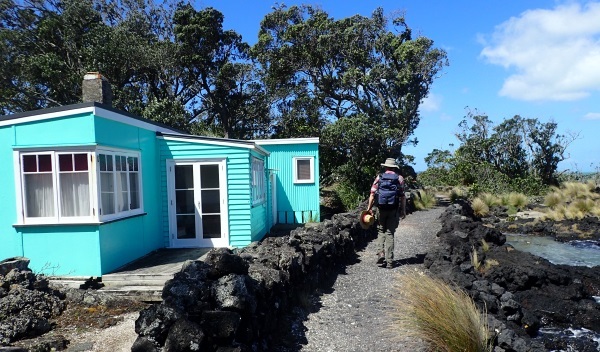 Along this route were about six “Batchs”, these are what the Kiwis call holiday homes. Each one had an interpretive sign indicating when it was built, who built it and who now occupied it. 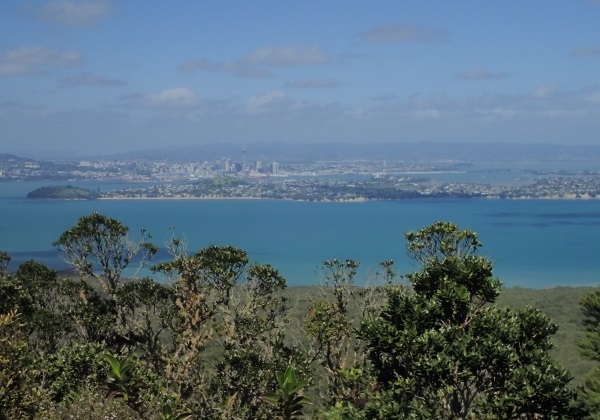 This batch has one of the longest histories on Rangitoto. 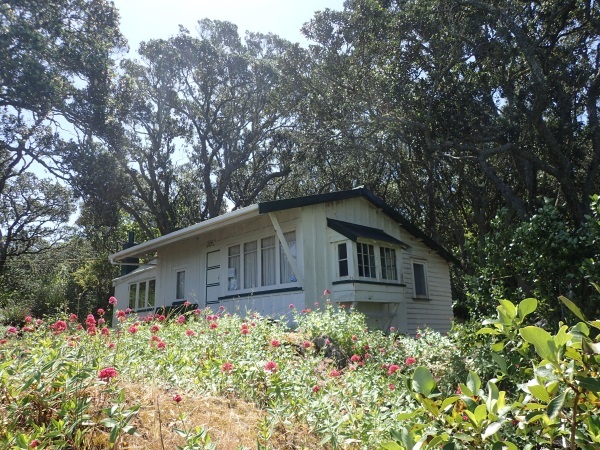 The site was approved in 1911 and the Collins family have lived in it since then. It has largely remained unmodified over the years and still has the working kerosene fridge that is still used today. We caught the 3.30pm Ferry back to Auckland and caught up with the guys before heading back to the French restaurant. A big thanks to Jox who was the co-ordinator of our three day sojourn in Auckland! In Auckland, we were staying in the tourist precinct downtown and had driven around the northern suburbs, checking out the mansions and beachfront houses along the coast-line. We’d eaten at great restaurants and bought coffee off a charming Japanese man in a coffee “shop” the size of a telephone box. We’d enjoyed the street performers and the cosmopolitan flavour of the city. There were lots of street people though, living rough – confronting for me ’cause I rarely see them on the Central Coast. 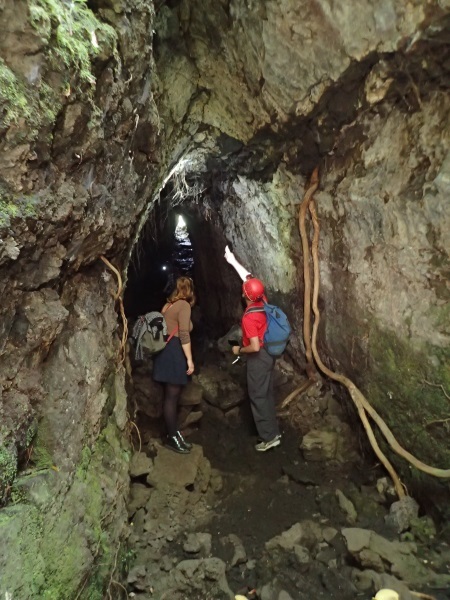 Over the next week of caving, we were in the country, more green grass than I’ve ever seen in my lifetime, charming country folk with their quaint accents, far, far removed from Auckland. It was rich pastoral country, lots of cows, goats, turkeys and millions of sheep (with lots of lambs). And, it was the first place that I’d been to in a long time where water wasn’t an issue, NZ is like one big drain, water everywhere! Then on the last day before we caught our flight, Jo, Ed, Heather and I took a small walk on the wild side looking for a place to buy lunch before boarding our flight. We drove aimlessly around looking for a fish and chips shop. We ended up in a suburb a few k from the airport and stopped at a strip of shops. Looked very dodgy, every shop had bars on the windows plus roller doors in front of the bars (double security). We had stumbled upon an area populated by Tongans, Fijians, Samoans and Maoris, (many of them in traditional dress) … didn’t see a single Caucasian for the half hour we were there. All the shop keepers were Indian, I suspect from Fiji. I for one was a little suss about the takeaway shop we went to (although the food I got was good) but Jo said it was the best battered fish she’d ever had. 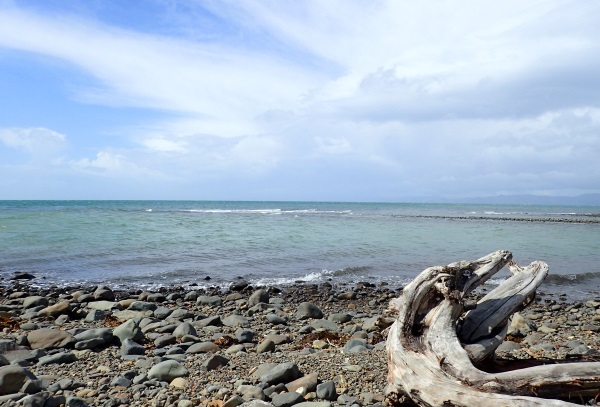 It was eye-opening to see the “other side” of NZ that we’d stumbled upon. 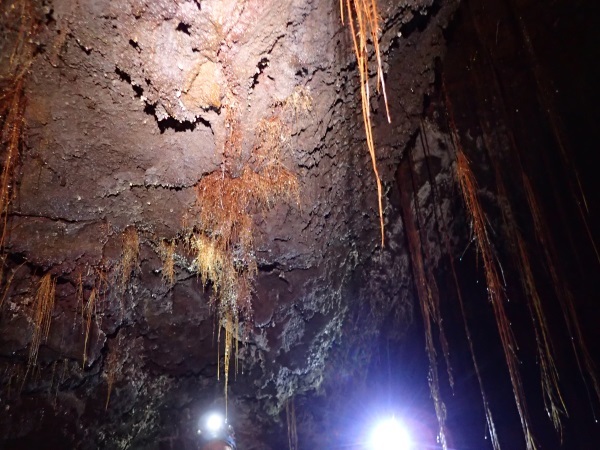 Stay tuned for Part 2, Our Caving Week … once I sort through the 750 photos taken! 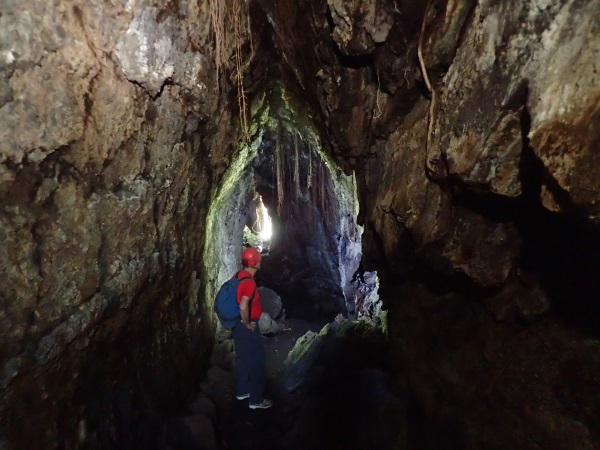 This entry was posted in Bushwalking, Caving, MSS, New Zealand, Road Trips. Bookmark the permalink.